- Designed to size a perfect master cone from any Gutta Percha Points. - Drop it into the apical size and cut off with a blade. - A convenient ring for Hand & Rotary Files. - Gauges from 1 to 30mm. - A simple & practical design for measuring files. - Gold plated ring prevents color change. 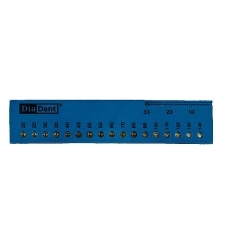 - Provides complete control of entire endodontic files. 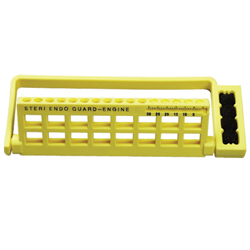 - Disposable sponges hold files in a convenient position. - Holds 16 NiTi Rotary Files. - Right or left hand use. - Available to insert sponge to clean or hold files. - Holds 32 Measuring Grades. 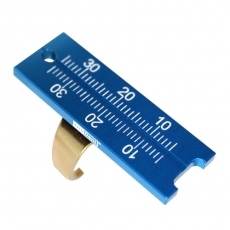 - Gauge from 12 to 27.5m/m, Including half measurements. - Flexible soft polypropylene tip syringe for root canal irrigation. - Autoclavable and chemiclavable for multiple use up to 50 times. - 1.3ml volume imprinted at intervals of 1mm. - Provides maximum clinical effect in a minimum of time. 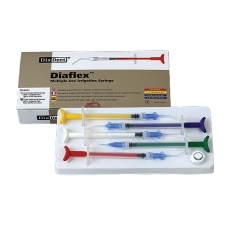 - DiaFlex is compatible with Luer Lock Syringes. - Has 6 Silicone Color Coded Silicone Cups. 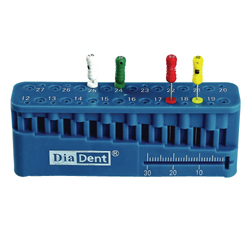 - Ideal for Organizing Gutta Percha Points & Paper Points. - Removable Insert for Cleaning. - Ideal for Organizing Hand Files. - A Versatile & Practical Organizer with a Clean Grip for Hand & Rotary File as well as Cups for Gutta Percha & Paper Points. - Holds 36 Instruments, 3 Silicone Cups, 1 Clean Grip. - Ideal for Organizing Hand Files & Gutta Percha Points & Paper Points. - Holds 64 Instruments, 4 Color Coded Silicone Cups.